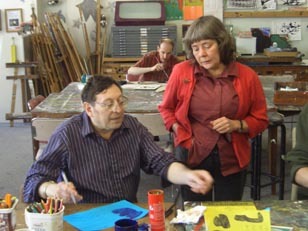 As New Zealand’s oldest creative space, Vincents Art Workshop provides materials, tuition and a supportive community environment for anyone who wants to make art with a focus on people with mental ill-health or physical, intellectual or sensory impairment. Vincents was established in 1985 in response to the de-institutionalisation of mental health service users. Its integrated focus included the wider community – a radical and visionary move at the time. Over the past 12 years, Vincents has won eight awards including the Big 'A' Creative Space Award 2012. Vincents’ artists view these awards as belonging to everyone at Vincents. “We’re like a family here and we like any good reason to celebrate,” Glen says. Vincents has an active involvement with community projects and events. It enjoys a close connection with the Wellington Zoo which it collaborates several times a year. 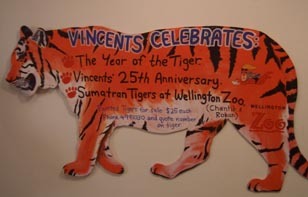 To celebrate Vincents’ twenty-fifth anniversary and the zoo’s two Sumatran tigers, Vincents’ artists painted and decorated 55 plywood tigers. These featured at the Newtown Festival and coincided with the Chinese Year of the Tiger. “Vincents is very present in the community,” Glen says. “We’re constantly creating pathways.” One project in the pipeline is working with Wellington City Council’s City Housing Department to encourage and, possibly, deliver art workshops in council flats. Vincents operates on the philosophy of potential and ability rather than disease and disability. Staff members believe that this approach has led to a high number of artists achieving national and international recognition – artists such as Martin Thompson, Reece Tong, Colin Korovin, Wendy Randall, Lynda Nelson, Emma Gregory and Victor Bright. For others, the success is that their involvement at Vincents has led to further training or employment. Glen cites one of the greatest achievements of Vincents as the nurturing of other spaces around the country with the same core philosophy of inclusion. She plays the mentor role with alacrity – perhaps most notably in Masterton, where she and her colleagues were pivotal in helping to set up King Street Artworks in the mid 1990s. Over the years, Vincents has developed extensive networks and partnerships in the community. For example, it started working with Arohata Women’s Prison in Tawa and its prisoners to establish a mural project. Glen says the project is providing a positive, creative outlet for the prisoners, along with social stimulation and the building of trust so that on release, the women may wish to attend Vincents to support their reintegration back into the community. Glen is certain that she will spend many more years at Vincents. In the meantime, she dreams of extra staff and tutors, greater street visibility, weekend opening hours and 24/7 accessibility. Vincents’ professional art tutors come from all walks of life and ranges of experience, and ultimately are selected for their understanding of the workshop’s philosophy. “They must genuinely love interacting with people, and realise they can learn as much from the artists as the artists can learn from them,” Glen says. Original generation time 1.3262 seconds. Cache Loaded in: 0.0004 seconds.